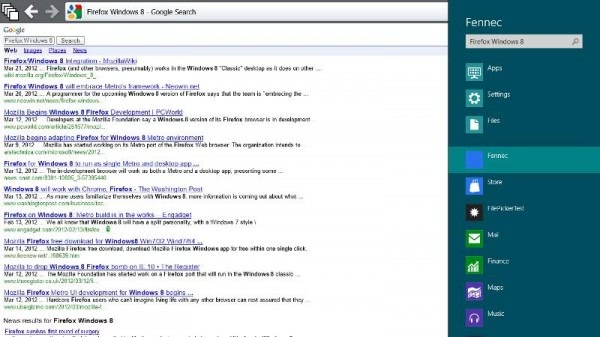 Mozilla plans to release a version of the browser for Microsoft's upcoming Metro user interface that ships with the Windows 8 operating system. You can read up on the plan here which basically aims to deliver a Firefox Metro version at the time the operating system gets released. One of the roadmap goals is the release of a working prototype in the second quarter of 2012. 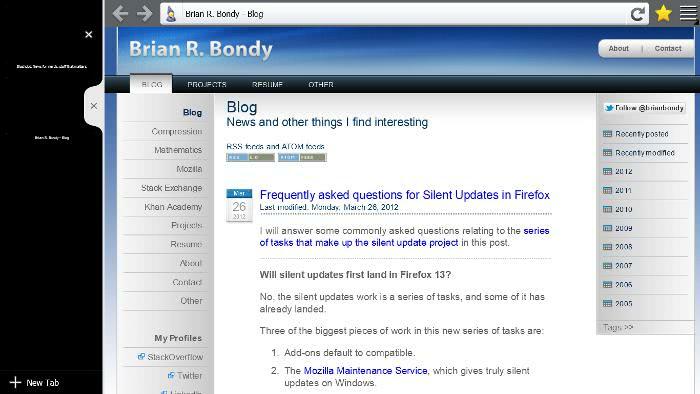 That milestone has been reached today, according to project head Brian Bondy who wrote in his personal blog that Mozilla has "a working browser in Metro". The browser at this point in time looks and feels like the Android browser, that is the Firefox for mobile browser. The prototype is based on the Fennec XUL code of Firefox mobile, which is working better performance-wise than the Android version. If that remains to be the case, the developers could consider keeping the Fennec XUL code which would put them ahead of schedule. If they run into serious problems, they might have to get away from the code though. 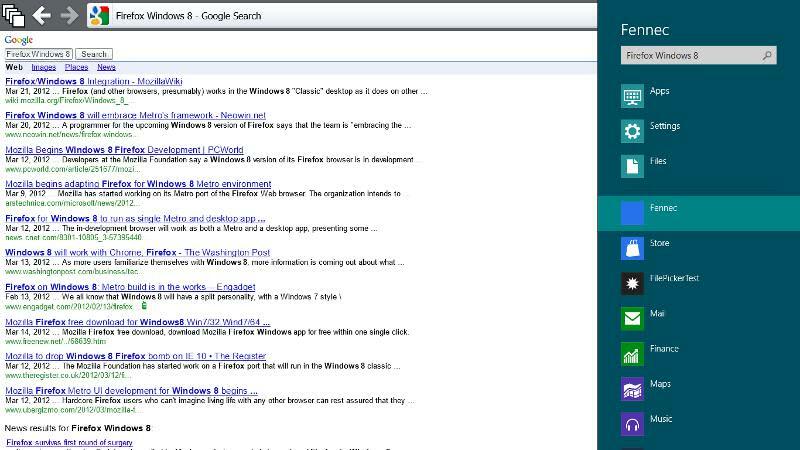 Two screenshots have been posted that visualize how Firefox Metro currently looks like. The first visualizes the full screen version of the browser under Metro, the second a full screen version with a sidebar attached to it. Plans are to create an installer for the Metro prototype in this week to collect design feedback and guidance which the devs seek at this point in time. The developers have also made progress as far as platform integration - that is Windows 8 platform integration - goes. Metro Snap is now working when Firefox is running. This basically allows you to snap another Metro app to a sidebar of the browser, just like you see on the second screenshot. Firefox Metro furthermore supports HTML file operations, like opening and saving files, as well as Windows 8 search support. You can enter an url into search which will then be loaded in the Firefox Metro version. Lastly, sharing has been enabled which you can use to share a page to another application, for instance Email, Twitter or Facebook. In the last paragraph of the announcement, Brian explains why Windows 8 Metro support is that important for Mozilla. Especially the fact that the Metro browser is also the default browser on the desktop, needs to be mentioned here. Brian believes that a great Metro browser could convince users to switch to the browser's desktop version as well. Browsers who do not support Metro risk losing market share. > Especially the fact that the Metro browser is also the default browser on the desktop, needs to be mentioned here. Didn’t tested that in Win 8 CP though (may test later). I have to admit that I did not try that out. It is not clear how this is handled in the final version. I personally believe that Microsoft will provide users with the option to switch browsers independently in both interfaces. > I personally believe that Microsoft will provide users with the option to switch browsers independently in both interfaces. Don’t know, if it be possible to make a good court case against restricting user’s choice to Metro browsers, – but also don’t see any good reasons to restrict users choice that way. No, IE will be the only browser for the start screen. Well, users should also have the freedom to choose whether or not to use the METRO interface. I personally think full-screen applications are not a breakthrough but a throwback to the old days of DOS, as well as the new Windows logo that is a copy of Windows 1.0 logo. Mozilla is making a correct strategy: if you can not fight, then join with them.